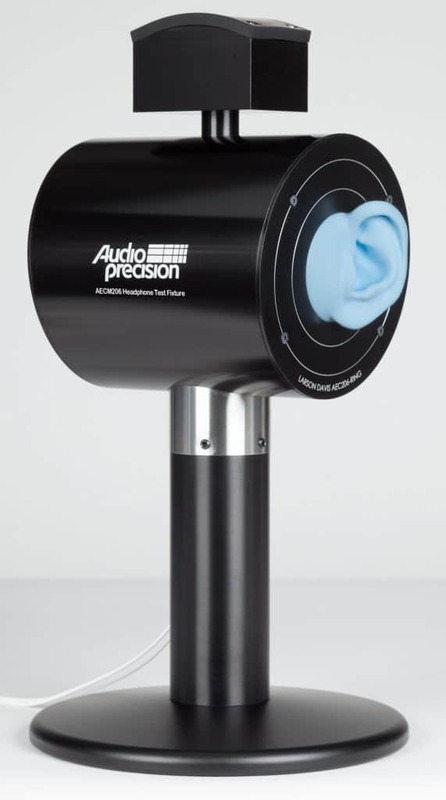 The AECM206 Headphone Test Fixture is a dense, robust fixture mounted on a resilient base to isolate ambient noise, which can adversely affect measurement integrity. Equally capable in both R&D and production test applications, it is well-suited for testing circum-aural, supra-aural and intra-concha headphones and earbuds. The AECM206’s high level of acoustic isolation also enables the measurement of noise-reduction performance of ANC (active noise canceling) headphones, as well as the evaluation of hearing protection ear muffs. The AECM206, in conjunction with APx Series analyzers, accessories and software, provides the user with a complete system enabling precise and repeatable electro-acoustic testing of headphones and insert earphones (earbuds). The Headphone Test Fixture is shipped fully-assembled and ready to use upon arrival, with occluded ear simulators (microphones with acoustic couplers) and preamplifiers installed and connected to BNC-terminated coaxial cables. The microphone/preamplifier pairs are TEDS-compliant, CCP-powered and calibrated. TEDS—Transducer Electronic Data Sheet—programming allows microphone identification and calibration information to be read by a connected instrument, such as the Audio Precision APx1701 Transducer Test Interface. From the lab to the production line, confidence in measurement results is integral to confidence in prototype or product performance. Calibration provides documented and traceable verification that instruments and accessories meet or exceed all of their published specifications. Each AECM206 ships with calibration certificates for its integrated occluded ear simulators and preamplifiers, enabling a complete, calibrated test set-up when paired with an APx Series analyzer and APx1701 Transducer Test Interface. When compared with a HATS (Head And Torso Simulator), the AECM206 is a more cost-effective solution for headphone test applications. For similar types of fixtures, the AECM offers competitive quality and performance at a lower price. The AECM206’s integrated occluded ear simulators are IEC 60318-4:2010 compliant.The fixture hardware meets ISO 4869-3:2007 requirements for the measurement of insertion loss. And the unit’s preamplifiers are CE compliant. AECM206 protected by contoured foam and shipped in a cardboard carton. AECM206 protected by contoured foam and shipped in a hard-shelled travel case. ICP® power supply / signal conditioner, three channels, x1, x10, x100 gain, battery powered. AC mains adapter for 480B21.